We’re taking time to celebrate ONFE’s Neighbourhood of monthly donors for their commitment to helping children and youth in Ottawa. 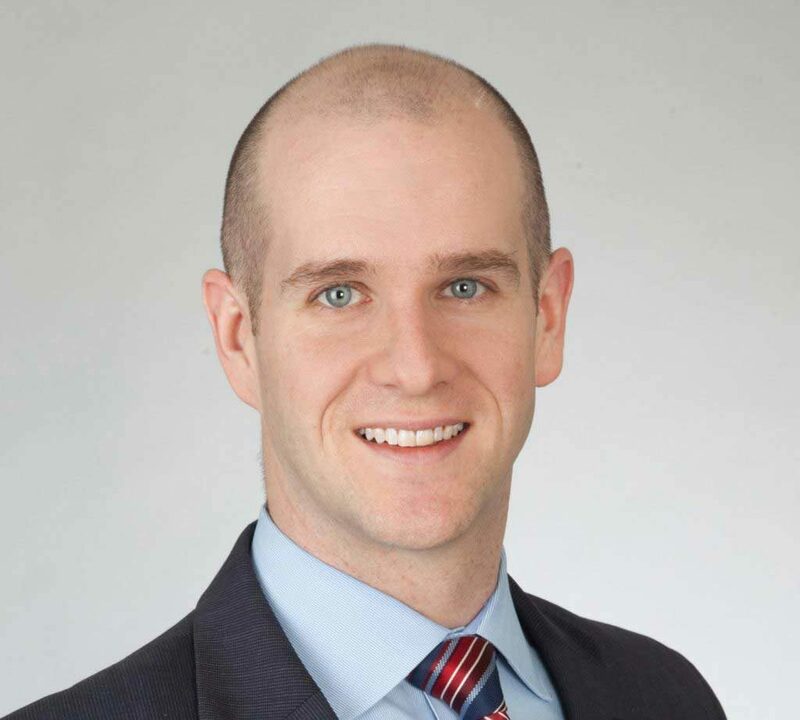 As a part of this initiative, we were able to meet with Kevin Reichstein, an Investment Specialist with Scotiabank, who recently decided to become a monthly donor after years of volunteering with JA Ottawa. Tell us about your experience with JA. When I was in high school in Mississauga I participated in the JA Company Program for 4 years. It was thrilling to meet people doing jobs in the real world, and having the opportunity to work with mentors in banking and with technology companies. That was my first experience. When I rediscovered the organization in Ottawa, I volunteered to facilitate the JA Company Program and JA Economics For Success. Awesome! Can you say more about what you learned as a student in JA Company? Each year we put together products, sold shares, went door to door, and did trade shows to make sales. There was a JA Company bank, and one year I had a job in this bank, dealing with deposits. I am a banker now with Scotiabank, and that experience was a really good opportunity for me to develop career skills and experience. The first product that I produced in JA Company was personalized stationery (back before there was Photoshop –we were avant-garde back then!). Another year we created a product called Booboo Bunny, a plush bunny made out of socks, and we sold out – that was a highly successful company. Yet another year, we created a First Aid kit, called Just in Case. It was a great idea, but as it had high input costs it didn’t do as well. But that’s a great lesson to learn as a young entrepreneur. As a volunteer with JA Company, I try to help the students learn that there’s a big difference between having the best idea in the world and selling a product. If you have an amazing product, but you don’t have sales behind it, your company doesn’t go anywhere. There’s always an ‘aha!’ moment there. It’s more than getting together with friends and making something; you actually have to sell. At the same time, I’ve seen JA Companies who are groups of personable, outgoing, great salespeople, who faced production challenges. So each JA Company has to learn that you need a great product, and a great sales strategy. What are the main lessons you like to teach with JA? I love teaching the JA Economics for Success program in school classrooms; I’ve been doing it for the last 8 years. I’m a Financial Planner, so teaching financial literacy at a young age really resonates with me. 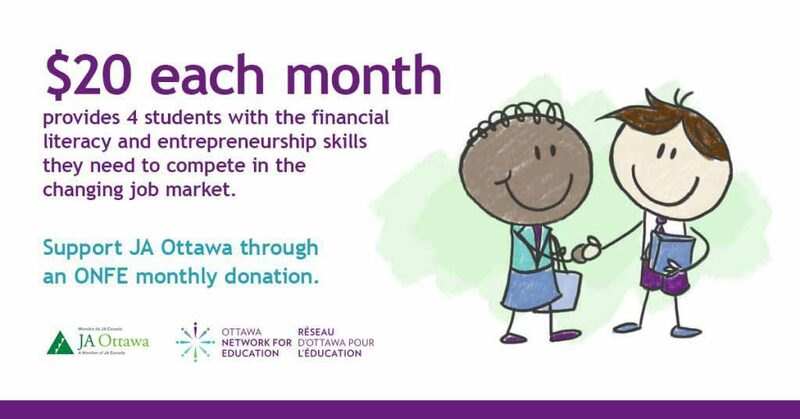 I see a lot of adults that don’t have a grasp on financial literacy, so to see students learn these skills –budgeting, managing a paycheque –is so rewarding. Why did you decide to become a monthly donor for JA? The program is fantastic, and I would love to be able to devote more of my time to it as a volunteer. But with work and small children at home, I can’t do as much as I used to. By becoming a monthly donor I can at least contribute and give back to the organization; it’s another way to help out. I give monthly to a few organizations, and I find it useful to make a contribution that continues in perpetuity. If it’s just a one-time thing, you might forget about the cause. I know my monthly donation is going to a good place and I know there’s constant funding. I would encourage people to volunteer. Different programs have different levels of commitment. JA Economics For Success, for example, only takes 1 day. These wonderful programs need volunteers in order to run the activities, in order to request more funding, in order to make these great programs happen. Whatever I give in time, I get back in great energy. Common feedback that I hear from teachers is that some students who don’t contribute in academic discussion will open up when talking about real-world challenges, such as in entrepreneurship. When you volunteer with JA Ottawa, you get to engage students who aren’t usually engaged, and I find that’s incredible. It helps students keep an open mind, challenge their conceptions, and realize they can succeed on a different blueprint. Interested in joining ONFE’s Neighbourhood of monthly donors? Click here! Excellent job, Kevin!! You are a role model to the students you are involved with! Very proud to know you and wish you every success in your endeavours!